belong to about spinning and learning to spin. Please excuse the sound effects on the above video - after the third take, my sense of humour failed and the birdsong and whistling will have to stay !! I spin using a modified short-draw method. I have tried the formal long-draw and short-draw, woollen methods but when I get into "production mode" seem to default to the above sitting. 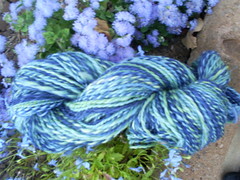 The nice thing about spinning is that you find your own method and way of producing yarn suitable for you. You start off with a roving or carded wool - this means the wool is cleaned/washed and prepared so the fibres are parallel and easier for you to handle as you pick up momentum. The above roving was prepared to order from Wingham Wool, using their blending service which I use a lot to produce quite distinct and heathery blends. It looks quite radical in the raw, but blends into super useable shades. For plied wool, I spin to bobbins of equal amounts in a clockwise direction, then ply in a anti-clockwise direction. Whilst this removes some of the twist, it does make the wool softer and for my knitting this is perfect to knit with at 4.5 - 5.00 mm. Then for stability it is plied on the bobbin, with the wheel going anti-clockwise, meaning that some of the twist is removed. 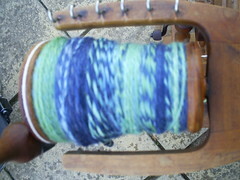 Wound off onto a niddy noddy and then finish by washing, which sets the twist. A tip that I owe to a friend of mine is to wash it in Lavendar Baby Shampoo - ooh smells lovely. 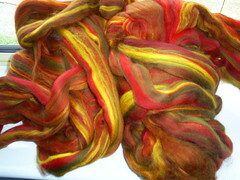 Another excellent source I have found for hand-dyed roving is Fyberspates. Jeni along with the Natural Dye Studio run clubs that you can belong to which supply excellent roving custom dyed, perfect for experimentation, small and large projects alike.